They can be cuddly or creepy, humanoid or like something from another world. They’re the robots currently making waves in the tech industry — and now you can find them all in one convenient online location. On Thursday, the magazine IEEE Spectrum launched ROBOTS, an aptly named online guide to the world of robotics. And not only is the site likely to trigger some laughs — and/or nightmares — but it could also shape the future of the industry. Currently, the ROBOTS site features 192 bots, including robo-celebrities Atlas, SpotMini, and Pepper and working bots Roomba, Da Vinci, and Curiosity. Clicking a robot’s thumbnail brings up a profile on it that includes a short bio, photos/videos, and details about the robot’s creation. 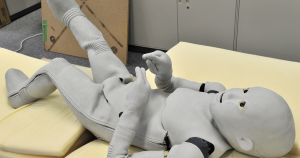 It also pulls up a ranking section where visitors can note how much they like a robot, rate its appearance on a scale of “creepy” to “nice,” and indicate whether or not they’d want to own the robot. IEEE Spectrum then uses this information to update three rankings: Top Rated, Most Wanted, and Creepiest. Telenoid, which looks an awful lot like the human being mascot from “Community,” currently sits atop the Creepiest ranking, but Diego-san, the big-headed baby bot, has our vote. Yikes. So far, experts seem to dig the site, both for its entertainment value and the role it could play in shaping the future of robotics. “This is the repository that future generations of humans and robots will look back upon with nostalgia,” Rodney Brooks, cofounder of iRobot, the company behind Roomba, told IEEE Spectrum. Of course, that’s assuming bots like ECCE don’t give the little ones nightmares.